Ep.9: So long, and thanks for all the fish! Ep.13: Liar. Liar. Pants on fire. In a brilliant move of counterprogramming, CBS decided to whack the kneecaps of NBC's Winter Olympics ratings juggernaut by having a show set in a warm, tropical climate, filled with half-naked young people. No parkas here! Sadly, FOX wouldn't sell them Temptation Island 3, so they had to make do with Survivor. And judging from the trouncing the last installment took from a running-on-fumes show like Friends, Captain Moonves and his crew decided that perhaps the best strategy might be to not compete directly with the Olympics, but instead to hang around outside until it was over. Surely there had to be more than a few couch potatoes still frozen stiff from watching one too many ice dancing competitions, right? Well then, backstabbing and bikinis should cure that right up. 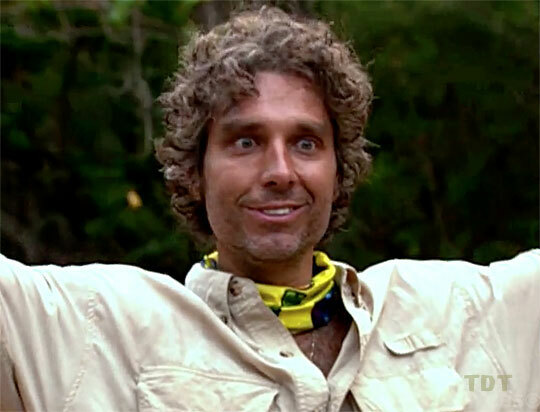 And if this bore more than a passing resemblance to the season of Survivor, the one that people actually liked (psst, it was the first one, Mark, even if you did loudly proclaim the Africa version as the best season ever), so much the better. Of course, now that even the minutest detail of the game's rules and strategies has been bent, folded, spindled and mutilated many times over, it will take all of Mark Burnett's editing hocus-pocus, not to mention an army of ILM magicians, to make the show's tired formula seem fresh and original. So perhaps a little tweaking is in order. Is it ever! Sadly, because he disappears way too quickly, most of the tweaking on this episode is done by none other than Peter, the hyper-exciteable yoga-talking guy, who likes to relax by blabbering incomprehensibly about orifices and bodily functions. Simply put, he is the dream of every person who likes to write bitter, nasty things about reality TV shows. We demand a recount! But we're getting ahead of ourselves here. (Oh come on, everyone on the planet knew he was getting the boot. Try to keep up, please). Anyway, we open, as always (*sigh*) with Jeff Probst speaking very dramatically about what we're about to witness. But this time, there's a twist! Within seconds of the Probster firing up his melodramatic spiel, Sarah begins puking into a bucket. Ahh, we knew there was something to like about her. Secretly, we hope her strategy is to win the other's favor by doing this every time Jeff opens his mouth. And it doubles as a simple, easy-to-maintain diet plan! Shockingly, Jeff informs us that there will be sixteen people this time, and the torture will last 39 days. And, after the requisite preaching about forming "a new society" and such, it's time to dump our new friends in the ocean, and watch 'em fight. The Rotu tribe gets the camera's attention first as they row off, singing songs, paddling in unison, and generally seeming like a bunch of teen-pop kids at summer camp. We already despise them. They get to their camp, do the group grabbing-hands thing, and are generally as blandly happy happy happy as the "It's A Small World" ride. But at least they don't have food. Meanwhile, Maraamu reveals itself to be the entertaining, dysfunctional tribe, as well as the ones who can't pronounce their own name. This may be because several of the people in this tribe may fare poorly if there's ever a mental challenge, but that's also why we like them. Peter of course is the first to talk to the camera from this tribe, further confirming he won't be around next week. As they row to shore, Sarah stops paddling and stands up in the raft, in an apparent attempt to use her built-in personal flotation devices as sails. Strangely enough, this experiment does not appear successful, although it does catch the ire of Sean. Who then proceeds to ingratiate himself to his tribe by playing dead on the raft once they hit the shore, then trying to exorcise Peter's Kundalini demons with an impromptu beachfront baptism cermony. Aw yeah, it's all good. Sensing that those chatty Maraamu are stealing all the camera time, the Rotu decide to get tough. The show needs a villain, and it might as well be one of us, they decide. Kathy draws the short straw, and gets her toes wet by bossing people around. Demonstrating her limitless knowledge of Survivors past, she orders the tribe to stop fiddling around with that silly magnifying glass, and get to making fire the patented Keith Famie way: rubbing sticks together. This not only endears her to her tribe, but allows them to, well, rub sticks together. Gabe demonstrates his lack of familiarity with daytime TV staples by comparing Kathy to the Skipper. Hello? Was Kathy walking around, hitting people over the head with her hat? If so, why wasn't this shown? Hmm, maybe he was talking about his Barbie collection, or something. Well if Kathy is the Skipper, Hunter (back in Maraamu) is definitely the Professor. Or as Sean (now playing the role of Presidential giver of nicknames) puts it, MacGyver. Although for all Hunter's alleged smarts, it's Peter and his mystical bag of yoga-tainted wind that gets fire going for Maraamu. Seriously, how can this guy get booted? "Okay guys, let's all sit around the campfire, hold hands, and listen to me sing Kumbaya for four hours. And no, my last name isn't Brady, why do you ask?" - Peter, who may want to nudge the dial back just a teensy bit from 11. Later, as soon as it gets dark, Rob and Sarah eye the raft conspiratorially, noting its remarkable resemblance to a waterbed. Minus the water of course. And the bed part. But you get the idea. If there was one. But anyway, as they leap in together, one tangled mass of air-filled spaces, no doubt discussing the latest theories in particle physics, the rest of the tribe looks on with suspicion. Are they there forming alliance? Nope, just spooning. Back at Rotu, Kathy seems upset that she got the role of being the bitchy one. To compensate, she bosses the rest of the tribe around some more. "We're going to go frolic at the waterfall, get food and have fun, dammit, or I'm going to have to break some skulls." After the requisite frolicking, food-gathering, and water retention, it's time for Kathy to whine about the fire again. It's day two at Maraamu, and they still haven't figured out how to pronounce their name. Rob guesses "Shamu," then proceeds to chase some chickens. As it turns out, wild rooster chases are about as successful as pursuits of other fowl. But it does bring back fond, bluegrass-tinged memories of good old Tom. Clearly, Rob was cast on this show to demonstrate that New Englanders can be just as slow-witted and unintelligible as people from the South. Yee-haw! Meanwhile, the stress of being the designated nag is starting to wear on Kathy. But she does win some Surviwhore points by shedding copious quantities of tears, so all is not lost. John builds tribe unity back by ignoring Kathy's instructions, and uses the magnifying glass to start the fire. Even boring Rotu has advanced to caveman status. Thankfully, they're largely absent from the rest of the show. Now it's time for Maraamu to find their water source. Rotu got a scenic waterfall/ swimming pool. And Maraamu gets... a slightly cleaner version of poor Samburu's elephant dung-infested swamp. Sorry guys! Those are the breaks. Better luck next reality show. With all the necessities out of the way, Peter takes a quick poll of his tribe, and they all tell him he may want to ease up on the crack just a tad. So he gets Sean to teach him some chill techniques. In Peter's hands, this apparently involves extended monologues on vaguely biological theories, as gleaned from dietary supplement publications and the visitor's guide to Sedona, Arizona. Sarah pats her head, in a silent gesture to the camera crew to please, please, hurry up with that straightjacket we ordered two hours ago. Luckily (for Peter), the treemail for the IC arrives first. Making a gigantic departure from Survivors past, this first challenge involves moving heavy things and lighting fires. Whew, where do they come up with this stuff? In a show of good spirit, Maraamu makes it interesting by trying repeated experiments to see if water burns. First, they check to see if they can light their torches from the floating fire buoy after they've dunked it under water. Not satisfied with this result, Sarah takes it upon herself to replicate the finding by dipping the torch beneath the waves. Deciding that getting the same result twice is good enough for most scientific publications, Maraamu race back to shore, to fax their discovery off to Nature. Getting back, they remember they were actually racing for immunity, which Rotu has long since won. Oh, the humanity! Then the wheels totally come off the Survivor truck. In the minutes left before tribal council, Mark Burnett casts his evil eye on three possible bootees - Tricia, Peter and Sarah - and all three actually get votes! We'll have to go back and check the record books, but this may be a first. Not falling for Peter's detailed explanation of his surefire strategy for team success (which appeared to be "everyone should vote for someone other than me"), the tribe easily boots the bug-eyed yoga master. He completes the subtle references to TV staples past by giving the patented Fonzie double-thumbed salute to his tribemates as he departs. At least they didn't show him jumping over a shark on water skis. Then again, that part was probably edited out.